New York Giants star Running Back Saquon Barkley won the NFL’s Rookie of the Year award this year. Barkley was the #2 draft pick in the 2018 NFL Draft (behind Baker Mayfield) after graduating from Penn State University. 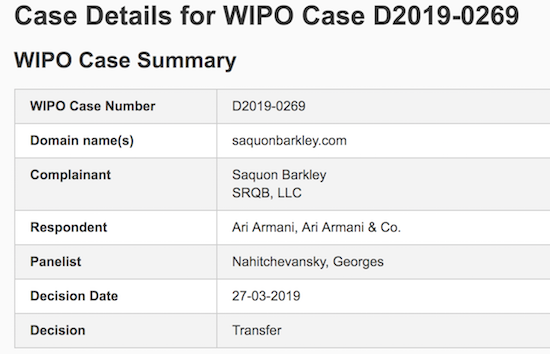 According to the World Intellectual Property website, a LLC that appears to be related to Saquon Barkley filed a UDRP against the SaquonBarkley.com domain name. It is WIPO case #D2019-0269. SaquonBarkley.com was registered back in December of 2014. From what I can see on CBSSports.com, it looks like the domain name was originally registered before Barkley became a star football player at Penn State – perhaps even before he played at PSU. The domain name appears to be registered to an entity in New York. When I visited the domain name to see how it is being used today, I was forwarded to Barkley’s Instagram page. Archive.org shows the domain name had previously been forwarding do a different website. 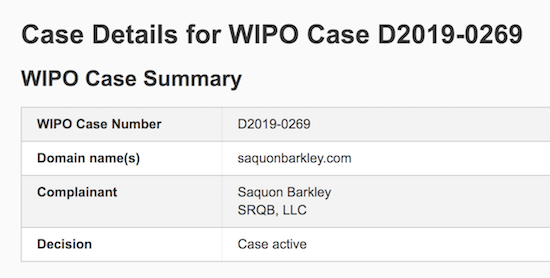 The UDRP was filed by Saquon Barkley SRQB, LLC. I can only assume the domain registrant is not affiliated with Mr. Barkley, hence the UDRP filing. I will keep an eye on this UDRP filing, but I would bet the NFL Rookie of the Year will prevail. Update: The decision won’t be posted until tomorrow, but it looks like Saquon Barkley won the UDRP.